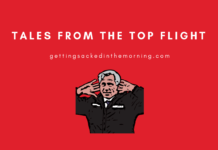 Funny Football News: Klopp claims Allison was coming anyway! I think there must have been a Liverpool media session yesterday, or something, because boy are they everywhere today. King Kloppo has had plenty to say in the last 24 hours, breaking his silence on Sergio Ramos, telling the world why he signed Allison (as if we don’t know, eh Loris?) and responding to Jose Mourinho. Jurgen, either just answering a direct question about the UEFA Champions League Final or clearly still struggling with it, accused Sergio Ramos of tackling Mohamed Salah like a wrestler in Kyiv. He called the incident “ruthless and brutal” before reminding people that Karius did get concussed by a Ramos elbow too. It might be time, for both the press and Jurgen, to move on from Kyiv and just accept that like him or (like most of the world) loathe him, Ramos ended the evening lifting yet another Champions League trophy. Kloppo went on the state, on the record, that paying a ridiculous amount of money for a goalkeeper with one half-decent Serie A season behind him had nothing to do with how Loris Karius had played in the final. From that telling statement, shall we presume that Jurgen and decided he was cack earlier in the season but when faced with the dilemma of Karius or Mignolet decided the German was the lesser of two evils? 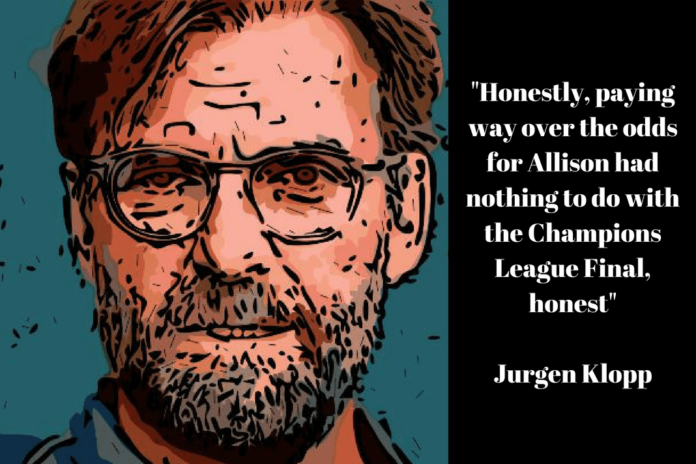 Jurgen claimed, “had Allison been available and Karius hadn’t thrown the ball into the back of the net we would have still gone for him!” OK, he didn’t say exactly that but the sentiment was there. Finally, and it won’t all be about Liverpool today, Klopp responded to Jose Mourinho‘s ‘surprise’ at Liverpool spending big money after their manager had been so opposed to extravagant transfer fees. Mourinho, needing to find something to talk about, suggested Liverpool have to win a trophy this season to justify the spend – probably completely forgetting how much he has spent since arriving in Manchester. Kloppo just flashed one of those smiles and said how happy he was that Jose was smiling. James Milner has said that Liverpool players need to score more goals themselves to take the pressure of Mohamed Salah and the retired England midfielder is more than happy to keep taking all the penalties to help spread the load. One player that won’t be scoring many more for Liverpool is Danny Ings who is expected to head south to Crystal Palace and immediately bump ex-Liverpool striker Christian Benteke further down the pecking order. Back in Manchester with Jose, he really is not smiling that much. Spending less than £100m does not a good summer maketh for Mr Grumpy and he is still scowling at Mr Ed in the hope that he might open up the chequebook a few more times. Jose isn’t even bothered about doing proper scouting, oh no. If two players have had a decent World Cup then sod it, go for them. Therefore, Ivan Perisic and Ante Rebic continue to be linked to Old Trafford for fees that would probably make your eyes water until you hear that Mourinho would still like to give Leicester City £60m for Harry Maguire – approximately £1m for each inch of his forehead. If either, or indeed both, of Perisic and Rebic do arrive then Anthony Martial will be allowed to put his hand in the lucky dip bin and pull out his new destination. Chelsea seem to believe that a year in South West London has somehow increased the value of Alvaro Morata and they have slapped a price tag of £62m on the Spaniard’s forehead, which is apt seeing as that is what he used to score most of his goals. Now, if only there was a club foolish enough to pay that kind of cash and, ideally, not be in the Premier League (sorry Everton, West Ham etc). Ah yes, AC Milan who overspent so much last season that UEFA pretended they would ban them from Europe. AC Milan, however, appear to be being a little bit more sensible and are unlikely to spend that much on a player that world force homegrown Cutrone out of the side. After all, they are not Chelsea. West Ham United are still continuing their annual ruse of making it look like they have turned over a new leaf in the transfer market, being linked to more half-decent players. Porto’s Moussa Mariga is the next striker that they would like to buy for a lot of money and then watch fail miserably. He may have scored 22 goals in Liga Nos last season, but that doesn’t mean Jack when you end up at the Athletics Stadium. The Hammers are also interested in Lille’s Kevin Malcuit who will probably end up scoring as many as Mariga despite playing at the other end of the pitch. Oleksandr Zinchenko doesn’t want to leave Peppy G and Manchester City any time soon even with Premier League new boys Wolves clearly thinking he might be Portuguese or something. Nuno, or should I say Jorge Mendes, would love the Ukranian to move to Molineux but Oleksandr is having none of it.